The keel for Monitor No. 9 (BM-9) was laid down in January 1899 at the Crescent Shipyard in Elizabethport, New Jersey by the Lewis Nixon ship works company. She was launched on 30 November 1901 and commissioned the USS Florida on 18 June 1903. 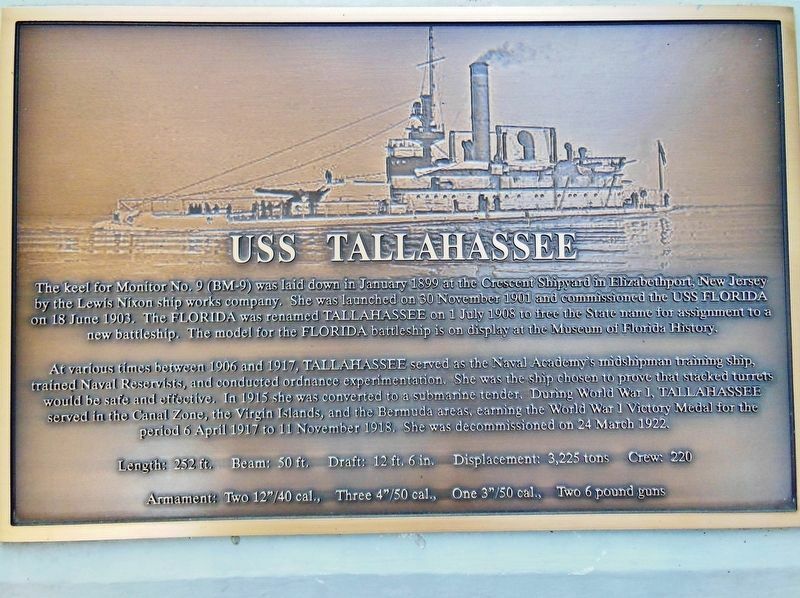 The FLORIDA was renamed TALLAHASSEE on 1 July 1908 to free the State name for assignment to a new battleship. The model for the FLORIDA battleship is on display at the Museum of Florida History. At various times between 1906 and 1917, TALLAHASSEE served as the Naval Academy’s midshipman training ship, trained Naval Reservists, and conducted ordnance experimentation. She was the ship chosen to prove that stacked turrets would be safe and effective. In 1915 she was converted to a submarine tender. 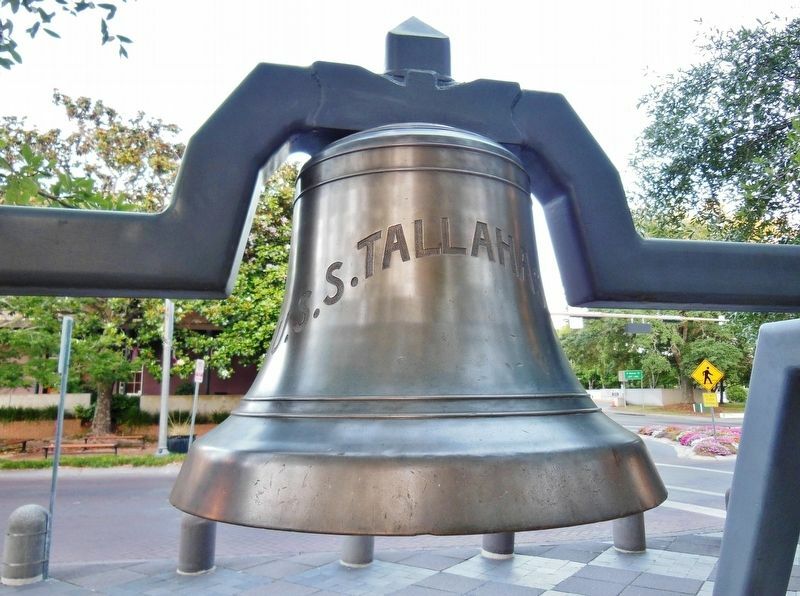 During World War I, TALLAHASSEE served in the Canal Zone, the Virgin Islands, and the Bermuda areas, earning the World War I Victory Medal for the period 6 April 1917 to 11 November 1918. She was decommissioned on 24 March 1922. Location. 30° 26.386′ N, 84° 16.93′ W. Marker is in Tallahassee, Florida, in Leon County. Marker is on South Adams Street south of West Jefferson Street, on the right when traveling south. Touch for map. 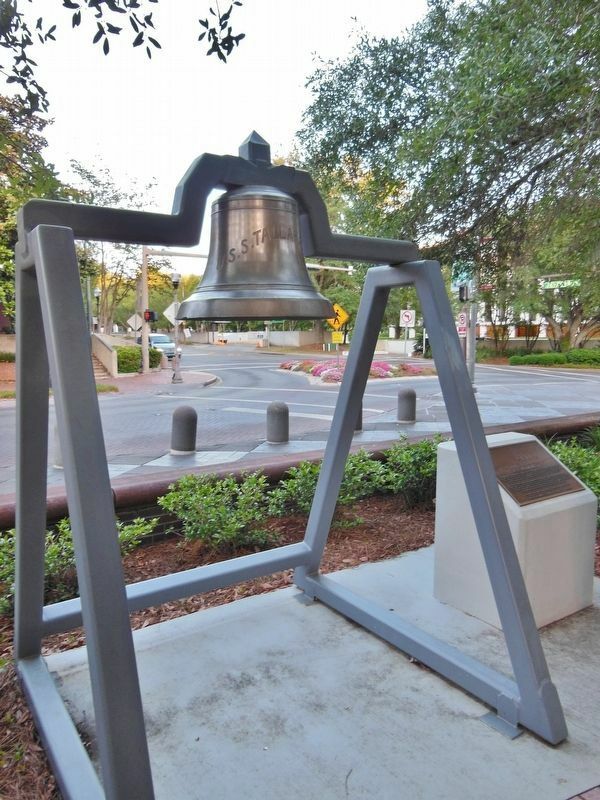 Marker and USS Tallahassee Bell are located within a plaza on the east side of Tallahassee City Hall. Marker is at or near this postal address: 300 South Adams Street, Tallahassee FL 32301, United States of America. Touch for directions. Other nearby markers. At least 8 other markers are within walking distance of this marker. Florida Sri Chinmoy Peace State (about 500 feet away, measured in a direct line); Florida Liberty Bell Replica (about 500 feet away); Lewis Bank (about 500 feet away); Leon County (about 500 feet away); Old Capitol of Florida (about 600 feet away); The Exchange Bank Building (about 600 feet away); Leon County Civil War Monument (about 600 feet away); Capitol of Florida (was about 600 feet away but has been reported missing. ). Touch for a list and map of all markers in Tallahassee. More. Search the internet for USS Tallahassee. Credits. This page was last revised on March 11, 2019. This page originally submitted on March 11, 2019, by Cosmos Mariner of Cape Canaveral, Florida. This page has been viewed 83 times since then. Photos: 1, 2, 3. submitted on March 11, 2019, by Cosmos Mariner of Cape Canaveral, Florida.